As the weather turns cooler and the kids head back to school, it’s the perfect time for some fun, harvest-themed crafts! If you’re like me, you may not be quite ready to break out the candy corn and pumpkins yet, so I’ve got a simple project for you using another classic symbol of fall, the apple! Even small children can help to create it, and you can do lots of different variations to keep things interesting. Step 1: Cut your apple in half, then cut one of the halves into two smaller slices. This part should be done by a grown-up, and kids should always be closely supervised around sharp objects. Step 2: Squeeze fabric paint onto a paper plate. We used red, but you can also use yellow, green, or some of each. Step 3: Use a sponge brush to apply a coat of paint to the flat surface of the apple half. Then, place the apple, paint side down, onto your surface. Pull it straight back up off of the surface and you should have a stamped apple image! Repeat this as many times as you like, applying a fresh coat of paint to the apple each time. To add variety, do the same thing with the smaller apple slice. This is where the variations come in…you can create any pattern you want, and you can stamp any type of surface you like to create all kinds of projects. We chose to make a dish towel, but you can also create a shirt, a bag, an apron, a canvas, a sign, or anything else you can think of. The process is exactly same, but the end results will be totally different! Step 4: If you’d like to add more color and detail to the apples, use fabric paint or markers to fill in stems, leaves, and/or seeds. If not, you can leave them as is. Let your project dry completely, then it’s ready to use or wear! These make great back-to-school gifts for teachers, which is what we’re planning on doing with the one Little Crafter made. 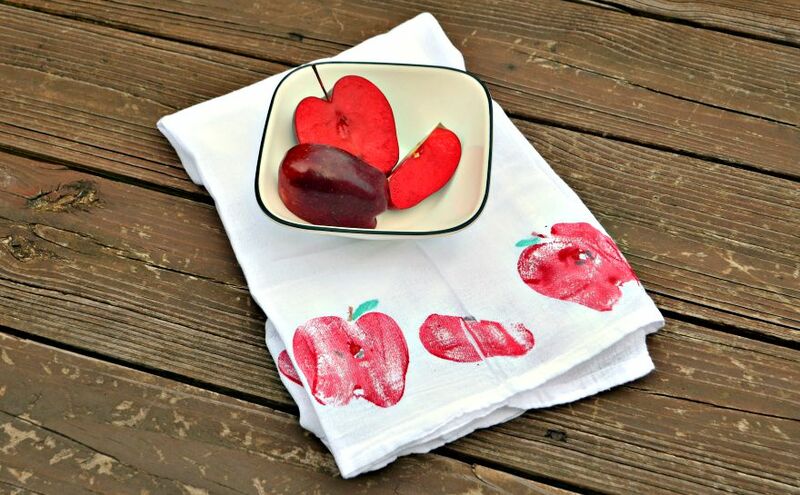 Who do you know that would love to make and/or receive a cute apple stamped craft? Amy Latta is a writer, mother, and DIY master. Happiest when crafting, she has “Honestly” doable tips for a creative atmosphere at home. When not covered in paint, Amy is a Brand Campaign Coordinator, a ballroom dancer, and a talented perfectionist.